a cataract and looks white. This prevents light from reaching the retina, causing vision loss. There are many reasons why cataracts occur. Some of these include: diabetes, hereditary, inflammation inside the eye, retinal degenerative diseases, age, trauma and toxicities. Breeds commonly affected by cataracts include Miniature Schnauzers, Cocker Spaniels, Maltese, Bichon Frises and Labradors. Medical therapy alone CANNOT restore vision in patients. It can only help to reduce the inflammation caused by cataracts. Cataract induced inflammation that is NOT controlled can eventuate in painful complications like glaucoma. Cataract surgery is extremely rewarding but requires commitment by the patient, owner and vet. 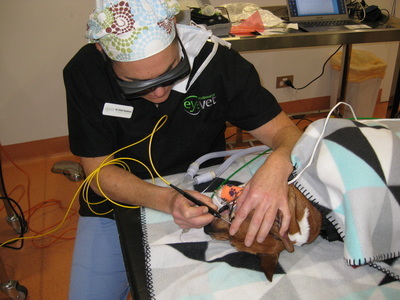 Essentially the same techniques employed in human cataract surgery are used on your dog. 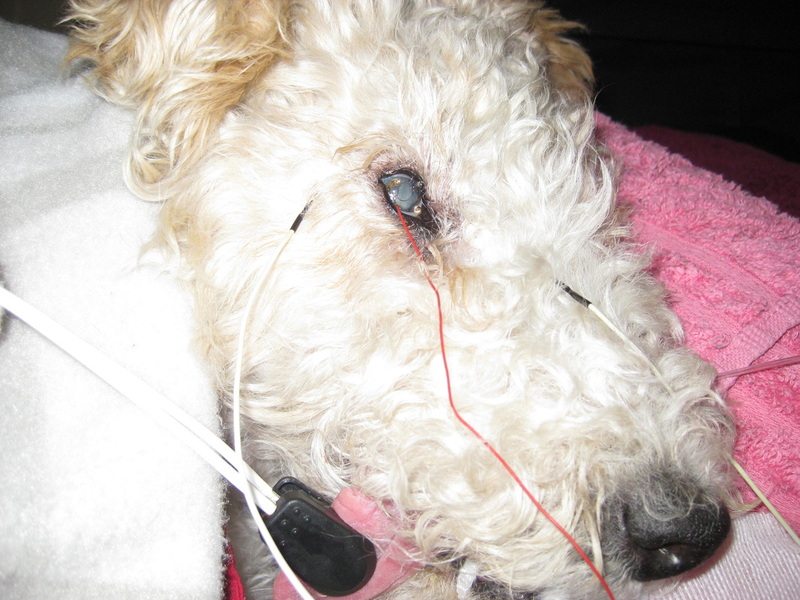 Specialised anaesthesia, phacoemulsification via 1.8 mm incision and replacement with an artificial lens are routinely performed. Since cataract surgery is elective we ask that all patients over the age of 8 years have blood and urine tested. 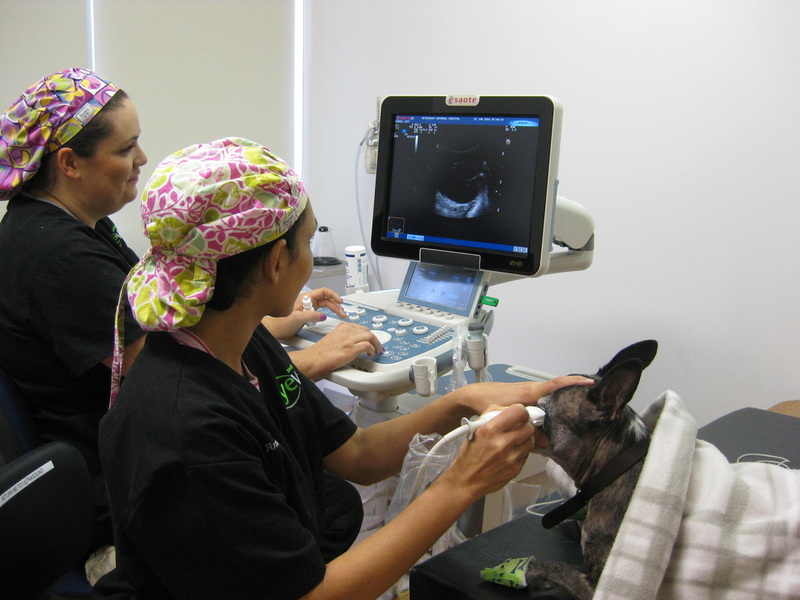 Other complicating factors like heart disease, airway disease or dental disease should also be discussed with your local vets. Three important tests need to be done before cataract surgery is undertaken. 1. Gonioscopy – performed in the consult room – assess the risk of glaucoma developing after cataract surgery. 2. ERG – Electroretinogram – performed on the day of the surgery – assess the health of the retina. 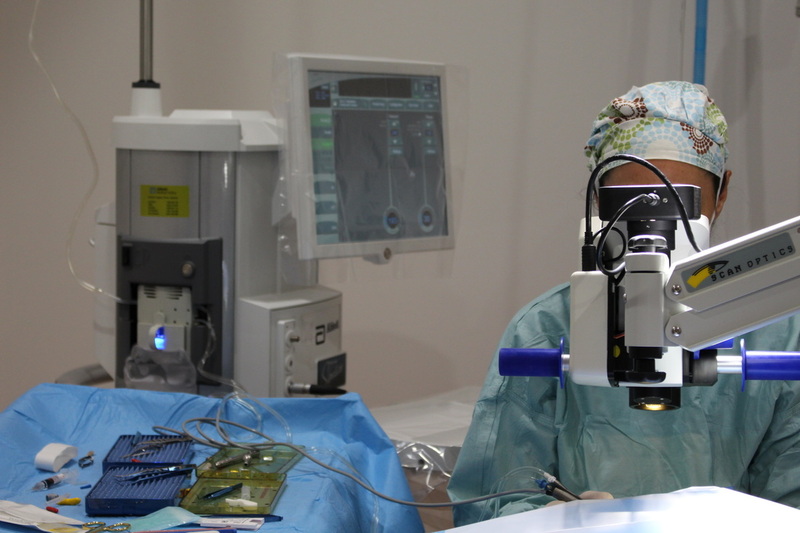 If the retina is damaged, cataract surgery will not restore vision. 3. Ultrasounography – performed on the day of the surgery – assess if eye structures are healthy and there is no retinal detachment. Patient will need to start medications before cataract surgery. before surgery, start intravenous fluids and check their blood glucose if diabetic. Drops are used for 2 hours before cataract surgery begins. Do NOT give your dog breakfast on the morning of the surgery. Access to water is allowed. Diabetic patients – give ½ of the normal morning insulin dose and NO food. Patient MUST come the next day for his/her first post-operative check. DAY 1, DAY 4, DAY 11 and DAY 24 POST SURGERY. These visits are included in the surgery fee. Following this time we advise 6 monthly checks to ensure the health of the eye. These are charged out as revisit consultations. Drops to control infection, pressure and inflammation are given immediately after surgery. Long term anti-inflammatory and anti-glaucoma drops are usually required. Head collar MUST be worm for the first 7 days. Operating early reduces the risk of complications. However even with early cataract surgery some complications can occur. No as cataract surgery is an elective procedure. Dogs with a good sense of smell, can live happy lives. However dogs with useful vision are more independent and confident.